I want to start out by saying that I absolutely love the illustrations! Dušan Petričić is talented! It is fun how the picture components are placed in multiple boxes on the page. This helps a child (or you) to easily focus on the photo and associate it with each bit of text. The odd angles of the text and photos make the page interesting. The colors are beautiful and the caricatures…well, they are awesome according to my son and I agree. I read this story with my eight year old son and my six-year-old daughter. When we finished I asked them what they thought about the book. No other audience really matters since InvisiBill is a children's book. My son looked at me and said it was cool. My daughter just smiled and gave me a thumbs up. That is pretty high praise for my wiggly jiggly daughter. When we reached the point where "the wonderful, terrible thing that happened" happened. My daughter thought that the family would notice right away and that they would miss Bill. I explained what was really occurring and we moved along. My kids could understand Bill’s frustration with busy parents and siblings engaged in their own interests. We all thought that Bill's hair looked like an orange pineapple as opposed to a pumpkin as it is described in the story. A great laugh was had at my expense when the peanut butter and pickle sandwich popped up in the story and I was delighted. We haven't heard of many people even knowing about them let alone willing to try them. I live in a family of six and ALL of them make fun of me when I eat one. I have loved them since I was a kid so I wish that I could be invisible and eat one in peace and quiet. So now Ms. Fergus needs to write a book about having others pay too much attention to what you are doing ;). 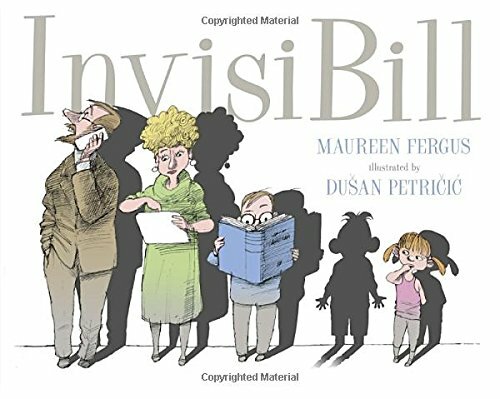 As a mother, I believe InvisiBill is a great story to read with your children and to spend a few moments discussing. We all feel invisible sometimes and this story is a good reminder to parents to set aside family time without allowing distractions. It is also good for a child to hear that other kids feel the same way and that they truly are loved even when they don't feel like it. As my son hopped out of the room after story time he looked back at me and said again that the book was cool. High marks! I received a hardback copy from LibraryThing's Early Reviewer program in exchange for my honest and unbiased review. Dušan Petričić was born in Belgrade, Yugoslavia, and graduated from the University of Belgrade Faculty of Applied Arts and Design. His political cartoons and illustrations have regularly appeared in major newspapers and magazines in Europe and North America. As co-author and/or illustrator, he has created more than forty children's books and is the recipient of many prestigious international awards. While pursuing his own career as an artist, Dušan has taken time to teach students illustration and animation.